TPC Las Vegas Hole 2: An island golf hole approached from an elevated tee. For those that miss the green in any direction, they will find the desert that surrounds. What makes it more exciting and more treacherous is that those that miss left or long will also find themselves (if they find their ball) well below the green having to hit a flop shot off desert high in the air just to hit the green. The green, however, if hit, is relatively easy to read and will yield birdies. 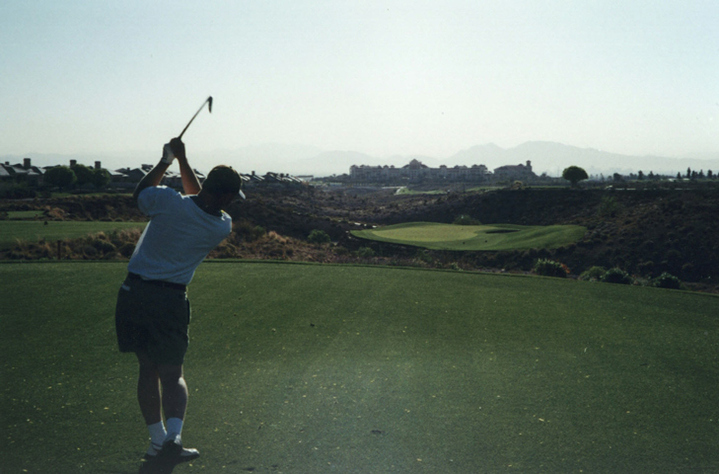 TPC Las Vegas Hole 3: This long par four features one of the most visually daunting drives anywhere. With the carry from the back two tee boxes being 200 yards plus with desert left and right, nothing short of straight and long will do to set up a penalty free attempt at the green. 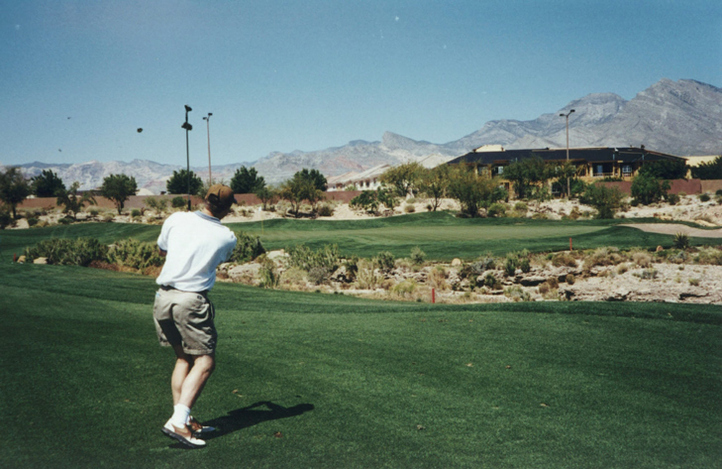 TPC Las Vegas Hole 5: A short, well-bunkered golf hole with the Las Vegas mountains providing a great backdrop. It doglegs left and the player has the choice of laying up or going over the left fairway bunker for a shorter approach to the uphill green, with a large pot bunker in front of it. 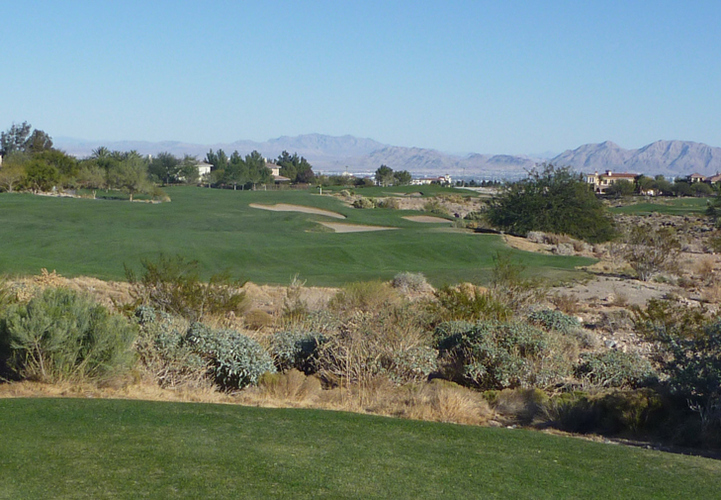 TPC Las Vegas Hole 7: This par three is pretty long and the player has to avoid going left. With the desert and a deep bunker over there, a right to left shaped shot is best, but a bailout to the right will leave a decent chip. TPC Las Vegas Hole 8: One of the tougher drives on the front nine begs the golfer challenge the fairway bunker on the right side, but that is where the hazard is. From there, the approach to the green is much more open as opposed to the friendly left side of the fairway, where the shot will have to go right over the sand. 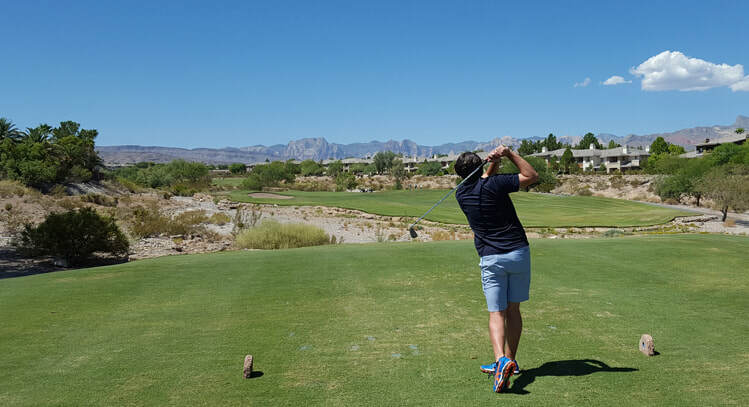 TPC Las Vegas Hole 10: The back nine starts with an uphill par four. The lake to the left is more of a distraction than a real hazard, but the desert to the left is definitely in play. However, over-correcting to the right will leave a shot that is likely blocked by trees or played from nasty lies as well. TPC Las Vegas Hole 12: This par three has a really large green that almost feels like two completely different shots based on pin position. 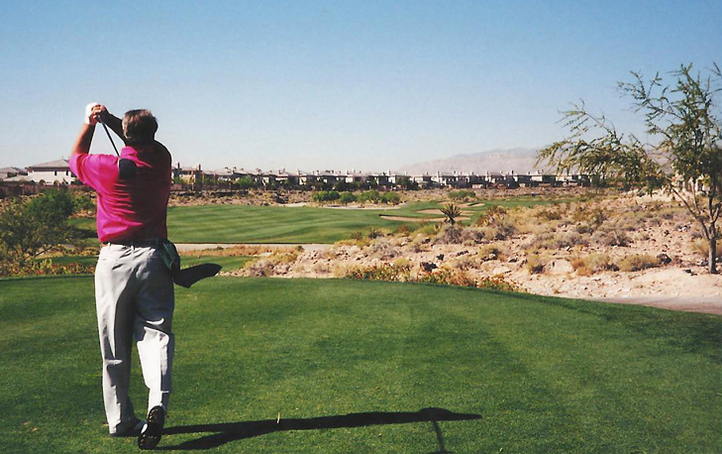 The front pin is easier but the shot cannot be short as that will find the desert. The back/left pin is tough as there are bunkers short and behind with desert left. The player can push it right, but the put from there is long and down over a tier as well. TPC Las Vegas Hole 13: Named “Death Valley” after the huge desert wash that must be crossed on the drive and avoided right all the way down the hole, it t is an intimidating hole from tee to green and visually stunning with the green grass, red desert and blue sky providing a great contrast. TPC Las Vegas Hole 14: The best hole on the course is a short dog leg right par 4 with desert everywhere but in the fairway. However, the approach shot is the real masterpiece as the green is shallow and double-tiered. Running in front of this is a surprisingly narrow, but frighteningly deep desert wash. Any shot hit short will find this and anything hit long will leave a slippery downhill chip towards it. 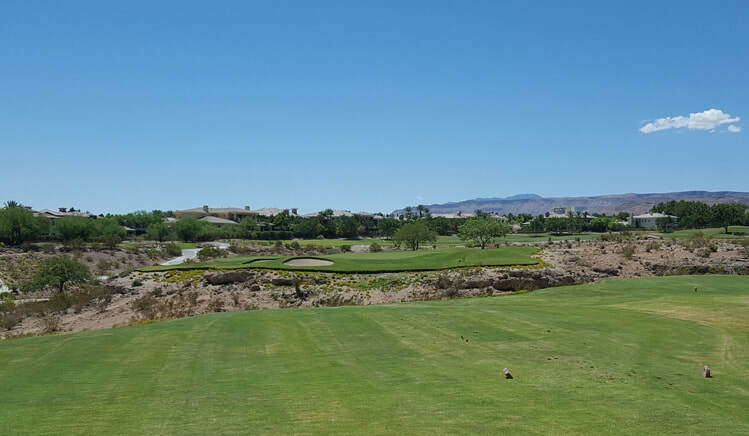 TPC Las Vegas Hole 15: This insanely long par five has a desert wash running down the right from tee to green. However, there is plenty of trouble left, including OB, for the golfer who is to meek, or weak, to play aggressive shots. 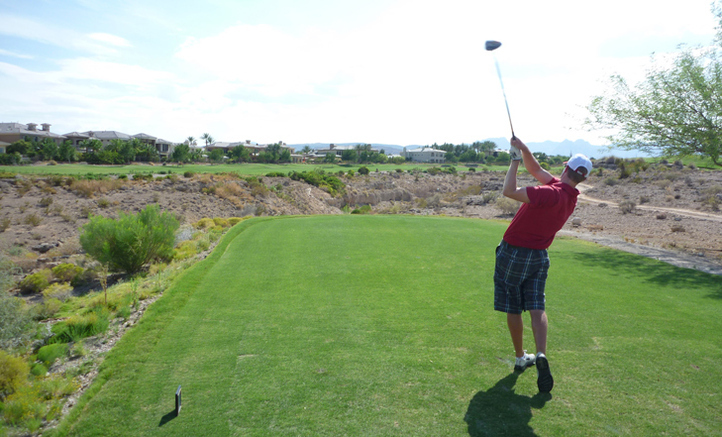 TPC Las Vegas Hole 17: The drive on this hole is fairly docile, unless a big drive is attempted. Such a drive can catch the downslope and leave just a wedge to the green, although the approach may be blind. However, there is desert that pinches in at that point. A shorter drive, gives a longer approach, but a better view to the green. 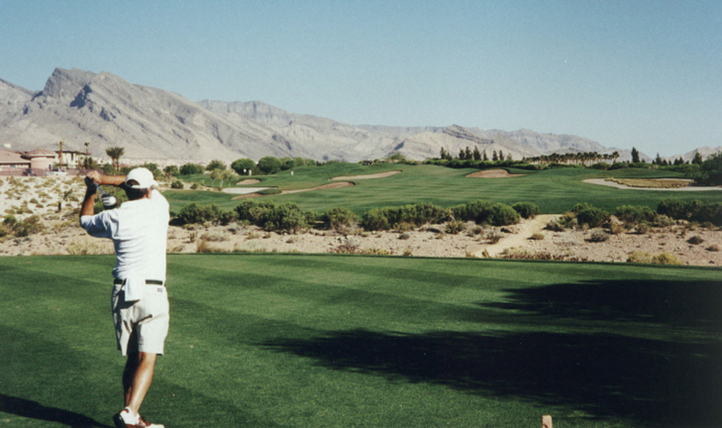 More Las Vegas Golf Course Reviews Await You.